I made a quick stop today at the Saturday Market to pick up a present for the birthday party. What to get a two year old? I chose a yellow/red tie dyed sun dress and two peacock feathers. Perfect. 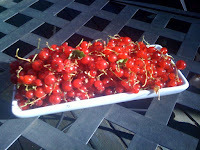 I also picked up a quart of red currants. Hmmm. Currants. They're charming. They're tiny. They're tart. They're beautiful. ..... and I have no idea what to do with them. I resort to some of my favorite cooking blogs for inspiration. Eureka! delicious:days saves the day.